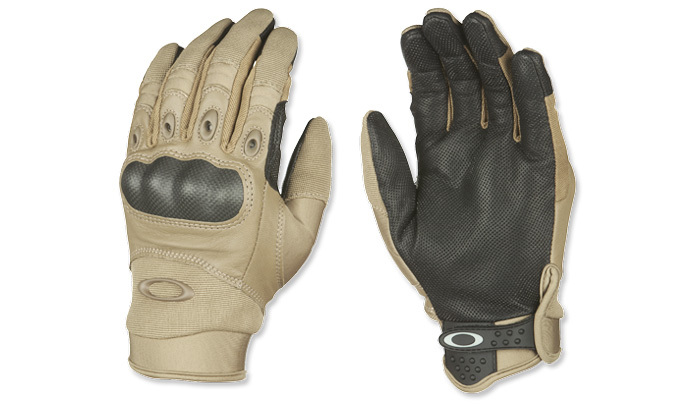 Oakley military SI Factory Pilot Glove is very popular among soldiers and operators of many special units around the world. The SI Assault Gloves have many useful features, like rugged micro-vented leather palm reinforced, carbon fiber knuckle plating, premium leather and durable synthetics with flexible articulated construction. Mesh zones and rubber exhaust ports are used for comfortable breathability. Surfacing on palms and fingers for a secure grip plus textured pull for easy donning. Palm is made of Pittards® leather with Digital® pattern for increased breathability and grip. Index and middle fingers have extra punched rubber non slip inserts placed on suede panels. Outer part is made of nylon and full grain leather. Knuckles are protected by ergonomically shaped lightweight carbon shell. Finger joints are covered with soft neoprene. Cuff is made of lightweight and flexible Airprene and is secured with hook-and-loop closure.